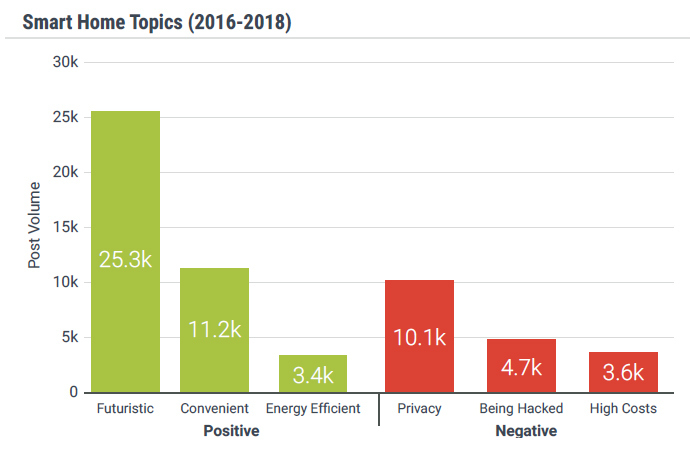 The 2018 Consumer Electronics Guide finds consumer sentiments towards smart home technology to be trending positively, with lighting and security among the most discussed topics. 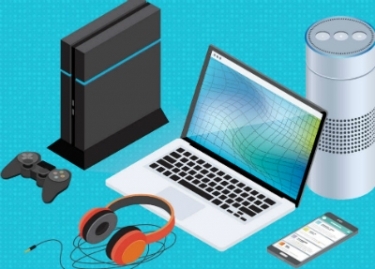 According to the 2018 Consumer Electronics Guide, discussions of smart homes have increased significantly over the last seven years, with post volume jumping from around 25,000 in 2012 to over 250,000 in 2017. Consumer sentiment about the smart home is on fire! The segment has seen exponential growth, with more people than ever talking about smart home technology on social media. Categories like smart lighting are enjoying between 85 and 93 percent positive sentiment from consumers, who cite the technology's futuristic appeal and convenience as influential factors. A recent study in the 2018 Consumer Electronics Guide by Crimson Hexagon, an AI-powered consumer insights company, tracked the overall trend of smart home technology and consumer sentiments as they relate to the most popular products found in a smart home. The guide features a number of graphs and charts, showing that consumers largely have an optimistic outlook on smart home technology. 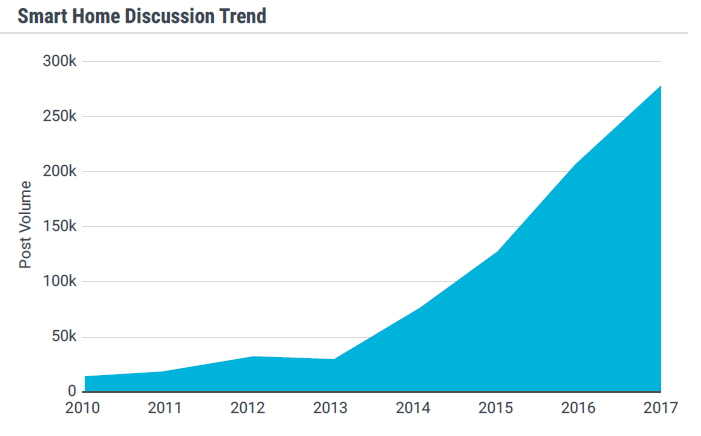 According to the data, the discussion surrounding smart home technology started to see a massive boost back in 2013. Post volume jumped from around 25,000 in 2012 to over 250,000 in 2017. It wasn't only post volume that started to jump, as from 2014 to 2017 the sentiment towards smart home technology started to sway, with over 60 percent of consumers favoring the technology. The study also took a look at the emotional responses people have when thinking about smart home technology, and how those emotions have changed over time. 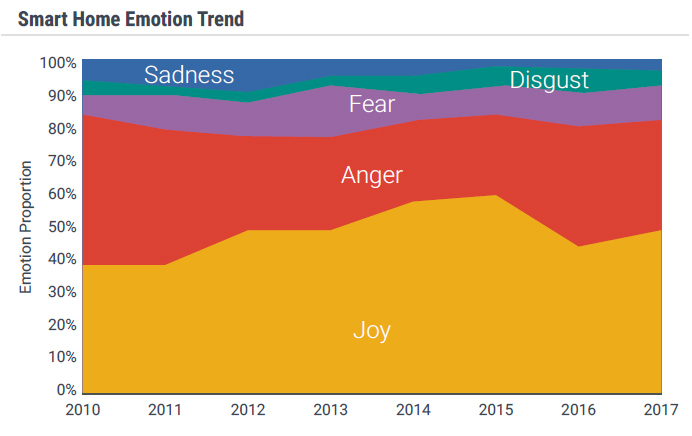 Joy was the most dominant emotion tracked, while sadness slowly decreased in most years. 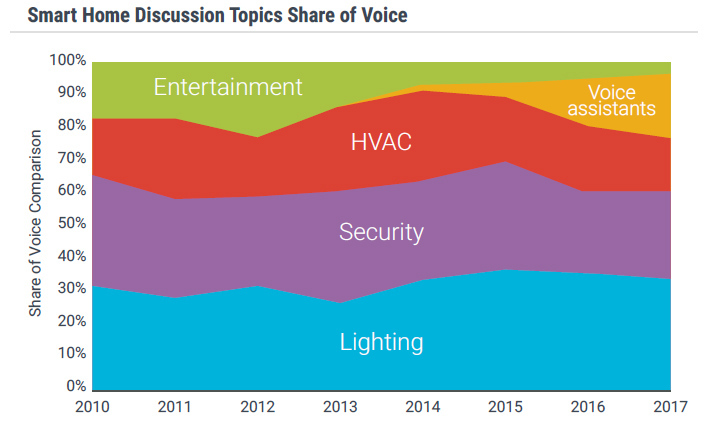 What researchers found was lighting and security dominating the conversation, with voice assistants seeing the most growth over the last 7 years. "Consumers are increasingly prioritizing efficiency and utility over entertainment and fun for their smart homes," the study says. "While smart homes may have begun as intriguing baubles for techies, they have quickly been adopted by a more mainstream audience that is looking for functionality more than futurism." The study also evaluated the positive and negative sentiments consumers had towards the five main components of a smart home. 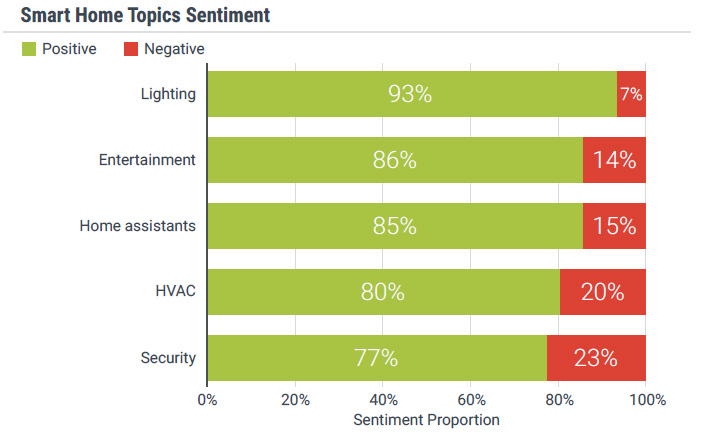 Lighting had a commandingly positive sentiment, while more contentious technologies like smart home security didn't do nearly as well. 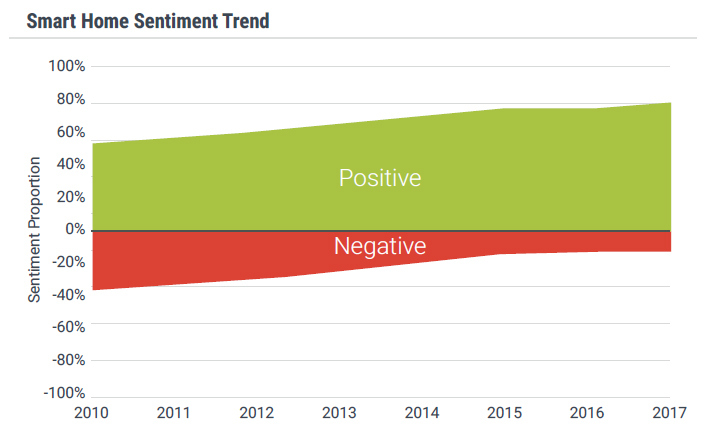 Alongside the sentiment evaluation, the study looked at what drove those positive and negative opinions towards smart home technology. "The main reasons people cite for smart home adoption are the futuristic factor, convenience, and energy efficiency. Consumers are excited about the technological innovation, believing that smart homes are part of the future," the study says. "Privacy concerns, fears of being hacked, and price barriers prevent some consumers from adopting the smart home trend. Some consumers worry that having a smart home means sacrificing data about their daily habits to tech giants like Amazon and Google," it continues. "News stories like Alexa devices creepily laughing at consumers or smart devices being hacked to help with a DDoS attack stoke fears about the potential consequences of a fully connected home." Finally, the Consumer Electronics Guide looked at the top smart home brands to find out which are the most popular. 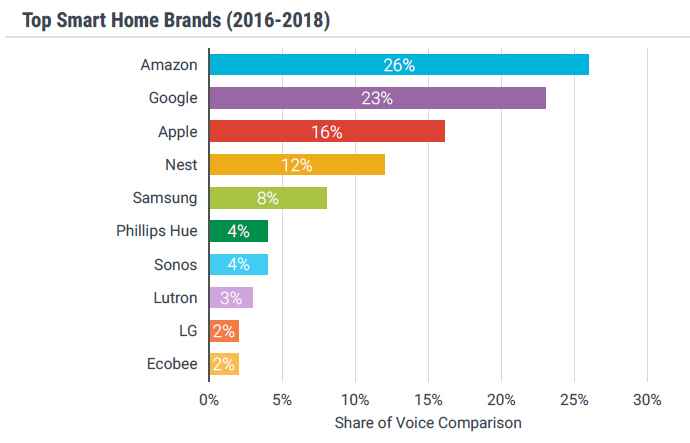 Unsurprisingly, the main three voice-assistance companies, Amazon, Google, and Apple top the list. 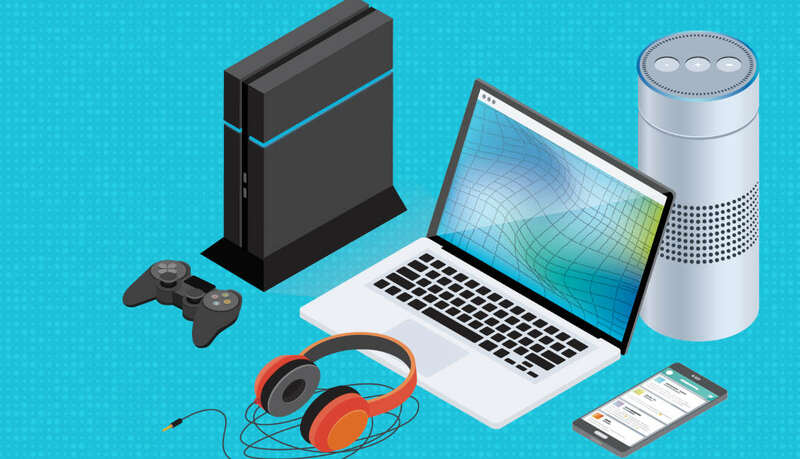 To download the full report on smart home technology, as well as reports on entertainment devices and personal devices, click here.